Our elegant 3-piece beveled mirror TABLE RUNNER has a 1/2" bevel and polished edges. These premium mirrors are made in Taiwan of the highest quality glass. 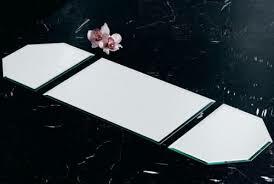 Each mirror is 5mm thick (3/16") with felt feet to protect your table surfaces. The 12x18" center mirror fits with two 9x12" cut corner end mirrors - making a total display of 36" in length. This beautiful 36'" mirror will enhance any table setting and is perfect for dinner parties, weddings, etc. Ships from Ventura, Ca. within 24 hours. FOR WHOLESALE PRICING OR CUSTOM ORDERS OF FIRST QUALITY BEVELED MIRRORS, call us at 805-650-0166 or email CRYSTALFANTASYINC@YAHOO.COM.